Vibrio cholerae bakteri penghasil enterotoksin. ^ (Inggris)Holmgren J. 1973. 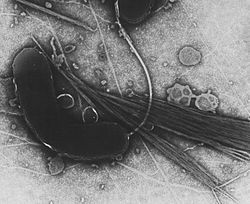 Comparison of the Tissue Receptors for Vibrio cholerae and Escherichia coli Enterotoxins by Means of Gangliosides and Natural Cholera Toxoid. American Society for Microbiology 8(6):851-859.